Pregnancy is known to be a state of “physiologic anemia” due to the disproportionate increase in plasma volume relative to red blood cell volume. This increase in blood volume is necessary to supply the fetus and placenta and begins very early in pregnancy. The plasma volume is already increased by 10-15% at 6 weeks of gestation and increases to 30-50% greater than pre-pregnancy volume by term. The red cell volume, in contrast to this, is only increased by 20-30% at term. This increase is prompted by a higher level of erythropoietin. Thus, despite a higher red cell volume, the hematocrit will fall during pregnancy. The greatest time of disproportion between the plasma volume and red cell volume changes will be at 28-36 weeks. Anemia during pregnancy is defined differently than someone who is not pregnant. 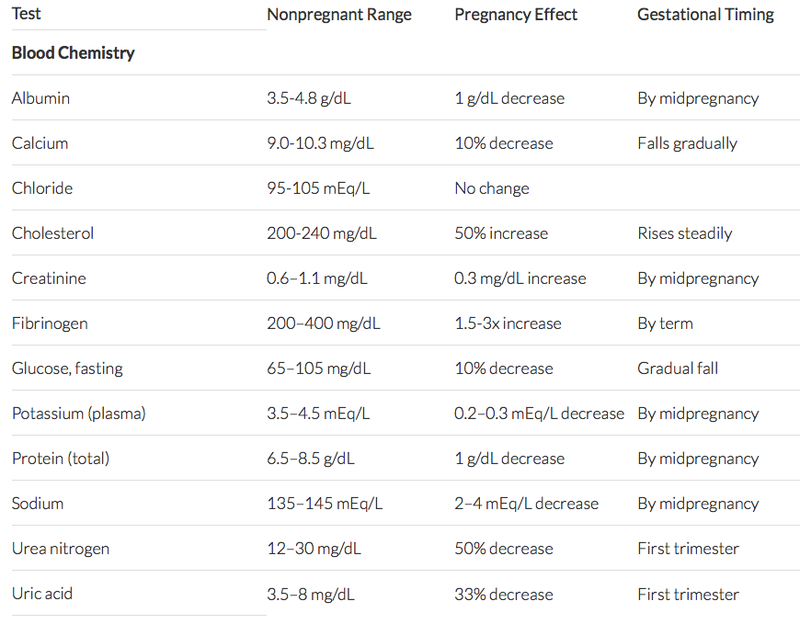 To be considered anemic during pregnancy the hemoglobin needs to be less than 11g/dL in the 1st or 3rd trimesters. Other hematologic changes in pregnancy include an increase in white blood cells, particularly neutrophils, and a slight decrease in platelet count. The average white cell count during pregnancy is about 9-15k. It increases up to term, and can go as high as 25k during labor. Platelets, on the other hand, remain in the normal non-pregnant range but mean platelet counts may be slightly lower than in healthy non-pregnant women. The “low normal” range is considered to be about 106-120k. There are also many changes in blood chemistries during pregnancy as well, mostly by the same dilutional mechanism as the hematocrit. Important among these are albumin, total protein and creatinine. Both albumin and total protein decrease by about 1g/dL by mid-pregnancy and creatinine decreases by about 0.3mg/dL. For other chemistry changes, see chart (below).